Photo: Jefferson Mosier House, ca. 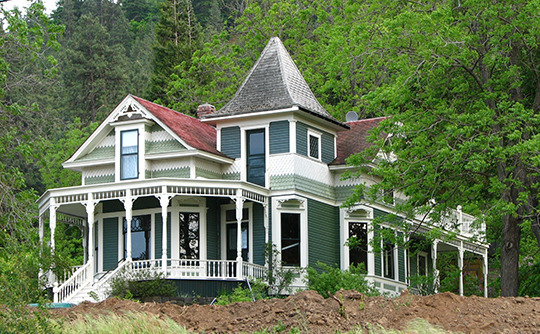 1904, 704 Third Avenue, Mosier, OR. Listed on the National Register of Historic Places in 1990. Photographed by User:Ian Poellet (own work), 2008, [cc-by-3.0 (creativecommons.org/licenses/by/3.0)], via Wikimedia Commons, accessed December, 2016. The Wasco County Courthouse is located at 511 Washington Street, The Dalles, OR 97508; phone: 541-506-2700. The County of Wasco was organized by the territorial legislature in 1854. This 250,000 square mile county was the largest ever established in the United States. It included all the land between the Cascade and Rocky Mountains, south of the Columbia River and north of the California–Nevada borders. Wasco County was reduced in 1859 to the land in Oregon east of the Cascades. The county was eventually broken into the eighteen counties which now exist. The discovery of gold in the 1860's in eastern Oregon and Idaho attracted prospectors. This influx of people created a market for cattle and sheep. The grasses of the county were conducive to cattle and sheep production. Gradually, the range operations gave way to wheat farming. Wheat production began when wheat seed accidentally got mixed with other seeds in a field near Dufur. Today, wheat is a major product of Wasco County. The fruit industry began production in Mill Creek Valley; the first fruit being shipped in 1890. The lower valley bottoms south of The Dalles and Mosier became productive fruit districts. By 1897, about 6,000 acres of land were in orchard use. The success of the area as a fruit district-inspired numerous land development schemes at the 'turn of the century. Subdivisions were platted and sold to eastern purchasers as prime orchard lots. Numerous old plats on record at the County Courthouse evidence the enthusiasm generated for these projects. The most extensive development of the time was the town of Ortley. At one time, this town contained over 300 residents and a developed commercial district. The early 1900's saw the coming of the railroad. A major line up the Columbia and extensions into the forests of Western Wasco County and south along the Deschutes River allowed the forest industry to become an important part of the local economy. In addition, equipment and agricultural produce was also more easily transported. The mid-1900's was an era of large government dam projects. Over 4,000 people were employed at the height of construction in the 1960's. This number was greatly reduced upon completion of The Dalles Dam. County of Wasco, Wasco County Comprehensive Plan: History, 1983, www.co.wasco.or.us, accessed September, 2013.